Raye was born in Little Rock, AK on Jan. 21, 1935. 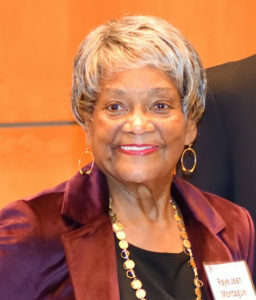 After high school graduation in 1952, she went on to receive her degree in 1956 from Arkansas Agricultural, Mechanical and Normal College, now University of Arkansas at Pine Bluff. Her field of study was business because no university in Arkansas awarded engineering degrees to black women. After graduating, she went to Washington, D.C. in search of a job that related to engineering and landed one with the Navy. She was hired as a digital computer systems operator requiring her to monitor and perform routine operations and maintenance. She took night classes to learn computer programming and after finishing the courses asked for a promotion. Her boss said she’d have to work nights. With no public transportation at night and not knowing how to drive, Raye bought a car, had the salesman drive her home, and taught herself to drive by leaving her house at 10 p.m. and arriving for work by midnight. She became a computer systems analyst, a position that involves incorporating new technology in the company’s current system. When President Nixon requested an admiral develop a new ship design, which usually took two years, Raye was given the assignment and told she had one month. This involved laying out step-by-step how a Naval ship could be designed using a computer. She finished the design in 18 hours and 26 minutes and revolutionized the way the Navy designed ships and submarines. She used a computer program she developed herself in the early 1970s and was the first person to design a U.S. Navy ship using a computer. It was the first draft for FFG-7 frigate (the Oliver Hazard Perry–class). Raye was married three times and had a son, David Montague, with her second husband. She died at the age of 83 of congestive heart failure on Oct. 10, 2018 in Little Rock.